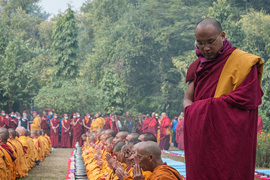 Karma Shri Nalanda Institute for Higher Buddhist Studies (KSNI) is a monastic college, or shedra, founded in November 1981 at Rumtek Dharma Chakra Centre in Sikkim by His Holiness the Sixteenth Gyalwa Karmapa, supreme head of the Kagyu order of Tibetan Buddhism. 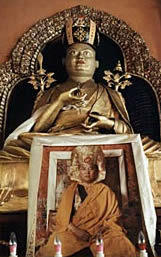 According to His Eminence Goshir Gyaltsab Rinpoche, the Sixteenth Karmapa's main teacher, the Eleventh Situpa Pema Wangchuk Gyalpo, established an institute for Buddhist studies at Palpung Monastery in Derge, east Tibet. 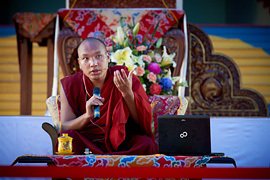 He told the Sixteenth Karmapa that great benefit had come from providing such a facility where the Buddhist teachings were transmitted and studied. 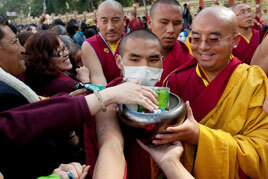 He also asked that the Karmapa establish such an institute, saying it would benefit the Buddhist teachings greatly. 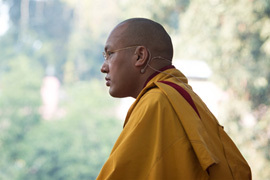 Through keeping the advice of his teacher in mind, the Karmapa had a vision of the great Pandita Vimalamitra, a scholar and mahasiddha instrumental in establishing Buddhism in Tibet, who said: "Establish an institute where the teachings will be properly transmitted and studied, and I will emanate as teachers and students throughout thirteen lifetimes." 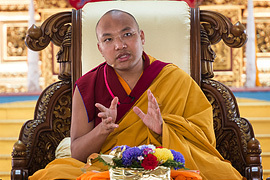 The Karmapa decided with certainty to establish such an institute in order to serve the Buddhist doctrine, a school in which the name of the institute would be reflected in the teachings and studies conducted there. 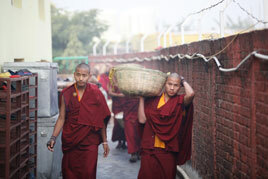 Though he began plans for the institute while he was at Tsurphu Monastery in Tibet, he was unable to complete them before 1959, when he fled into exile due to the Communist takeover. 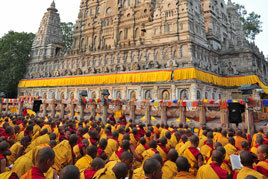 Construction of Karma Shri Nalanda Institute began in 1980 and was completed in 1982. "Nalanda" was the name of one of the most illustrious Buddhist universities in ancient India and according to Buddhist historical records, it was the home of numerous great scholars including Nagarjuna, Aryadeva, Vasubhandu, and Santaraksita. 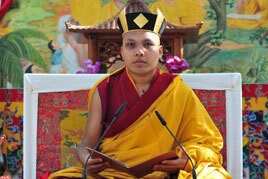 The name "Karma Sri Nalanda Institute" was given by the Karmapa during the construction phase. 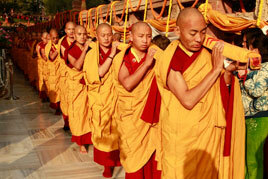 Principals, abbots, and assistants were appointed by the Karmapa. 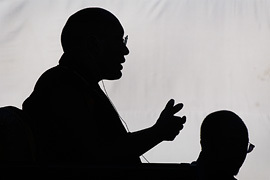 His Holiness also instructed that the students were to follow the rules of the Vinaya (the code of conduct for the ordained sangha as taught by the Buddha) as explained in the commentary by the Eighth Karmapa, Mikyo Dorje, and their curriculum would follow the authentic Kagyu tradition. 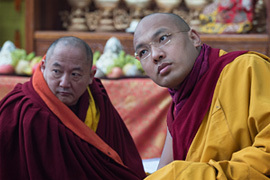 Every detail of the institute, such as the times of classes and the yearly calendar, received the Karmapa's personal attention and was recorded in a thirteen-point memorandum. His Holiness placed great importance on establishing the shedra and one of his last wishes was that the new institute be inaugurated. 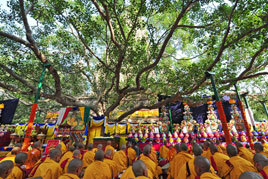 Such an inauguration ceremony took place on November 18, 1981, almost two weeks after His Holiness passed into parinirvana and on the day of Lhabab Duchen, which commemorates the Buddha's descent from the realm of the gods. The ceremony was performed by the appointed directors of the institute, the regents, and Mr. Dhamchoe Yongdu, the general secretary of His Holiness the Sixteenth Karmapa. 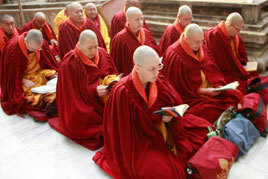 After the funeral ceremonies for His Holiness concluded, forty-five monks from various Himalayan monasteries gathered for the institute's first classes in December. Khenchen Thrangu Rinpoche began the day with a teaching on Jetsun Dolma, the wisdom deity Green Tara, and continued with the Bodhisattvacaryavatara, the classical Indian text on the bodhisattva ideals of Mahayana Buddhism by the eighth century Indian saint Shantideva. Classrooms, student living quarters, a kitchen, and dining room make up the five-story building. Now, the original Karma Shri Nalanda Institute also houses the Golden Stupa, the reliquary monument for the Sixteenth Karmapa. 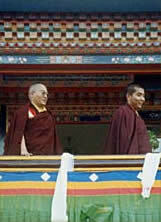 In 1981, when the building was nearly complete, the supreme Fourteenth Dalai Lama visited at the request of the Gyalwa Karmapa. He was received to the accompaniment of ritual music and offerings of incense, and taught on the Aryaprajnaparamitasamcayagathasutra and The Jewel Ornament of Liberation by Gampopa. 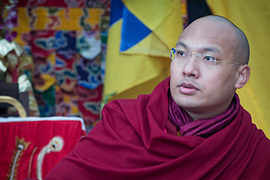 The Dalai Lama gave profound and extensive advice to the teachers and students, and encouraged them to exert themselves so the intentions of the supreme and precious Karmapa would be fulfilled. 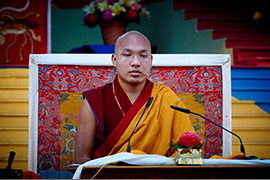 After the Karmapa passed away in 1981, his spiritual sons and administrators affirmed their intention to carry out his wishes exactly as he had stated. 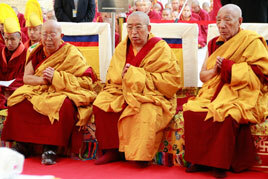 The principals, who had been appointed by the Karmapa, based their activity on his intentions. 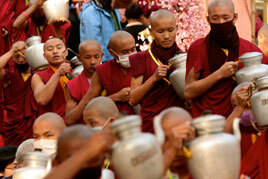 The first principal was His Eminence Jamgon Kongtrul Rinpoche. As seen in 1987, the original KSNI is on the left as the new building undergoes construction above it. 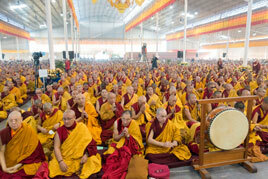 It was His Holiness' intention that the institute would gradually expand to include at least 300 students. As enrollment grew in the early 1980's, the original building became too small and plans were made for new and larger accommodations. 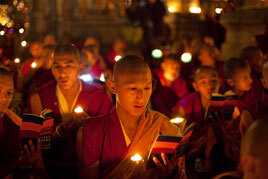 Under the directorship of Jamgon Kongtrul Rinpoche and according to the wishes of the Karmapa, the construction of an annex building began in 1984. 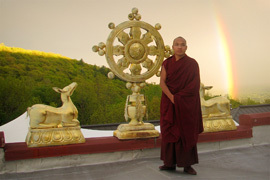 Tenzin Namgyal, then deputy secretary of Rumtek Dharma Chakra Centre, served as project supervisor. Due to His Eminence's tremendous effort, the institute received generous donations from disciples and centers of the lineage, and with the joyful participation of the students, the building was completed in 1987. This five-story annex includes a library, a main shrine and lecture hall large enough to accommodate over a thousand students, classrooms, offices, kitchen and dining facilities, a side courtyard for debating, and living quarters for the abbots, teachers, and students. On the top floor are the Karmapa's personal quarters. The new building is constructed in the traditional Tibetan architectural style, beautifully ornate and resplendent in the bright colors that mark Tibetan Buddhist sacred art. Exquisite wall and ceiling paintings grace the main shrine hall, executed by a team of artists under the direction of Thinley Chojor, now resident master painter at Karma Triyana Dharmachakra, His Holiness' North American seat. Three great statues of Shakyamuni Buddha, Manjushri, the deity of wisdom, and His Holiness the Sixteenth Karmapa line the altar, complemented by smaller images of the Sixteen Arhats, and the texts of the Kangyur and Tengyur. Thangkas of the Gendruk Chogngi, the eight most eminent Indian scholars of Buddhist philosophy, hang on each side of the altar. An ornate throne, ready for His Holiness the Seventeenth Karmapa, Ogyen Trinley Dorje, looks out over rows of cushions that sit on top of the polished marble floor. 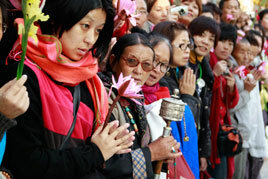 Students assemble in the hall each morning and evening for group Manjushri and Mahakala practice, respectively. 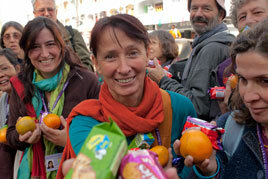 Examinations and seminars are also held here. 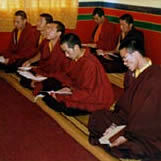 Their Eminences Jamgon Rinpoche and Goshir Gyaltsab Rinpoche, then the acting directors of KSNI, inaugurated the new building in June 1987 at a festive opening ceremony that included speeches of congratulations, and dharma talks given by prominent teachers. Seven hundred distinguished guests attended, including the vice-chancellor of Sampurnanand Sanskrit University (Varanasi, U.P. ), the secretary of the Ecclesiastical Department of the government of Sikkim, representatives of various Buddhist institutes, scholars, teachers and many other friends and well-wishers. Later that year, His Holiness the Sakya Trizin, supreme holder of the Sakya lineage, visited and gave the Manjushri empowerment to the students of the institute. 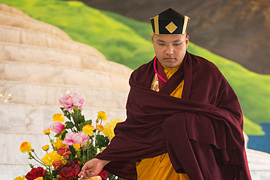 With the opening of the new building of Karma Shri Nalanda Institute, a long-cherished aspiration of His Holiness the Sixteenth Karmapa was fulfilled.